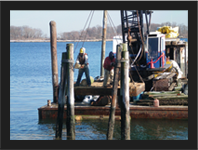 Concavage builds and installs stationary and floating docks, boat lifts, and retaining walls throughout New York, New Jersey and Connecticut ocean going waters. We apply the same principles in residential construction that we do in large-scale commercial, so marine structures are built to last, to match your environment and to meet your expectations for appearance. Concavage constructs large scale marine structures including piers, boardwalks and large retaining walls and also handles operations including dredging, jetty construction and salvage (a more complete list can be seen below) with a fleet that includes crane barges, tugs and specially equipped workboats.